The monument of Ismoil Somoni is situated on Ozodi square. The height of the monument is more then 25 meters. 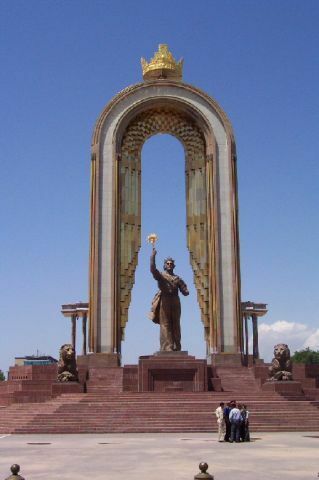 This monument was placed in 1999 in honor of 1100 anniversary of the state of the Samanids. The monument is richly decorated with gold and looks impressively. Abu Ibrakhim Ismoil ibn Akhmad Samani (April, 849, Fergana – November, 24, 907) was the amir from the Sasanids dynasty , the founder of the state in Central Asia. There are several suppositions of his place of birth. The researchers think that he was born in Fergana or Balkh. Ismoil was born in the family of the local aristocrat, Akhmed, the son of Saman-khudat.